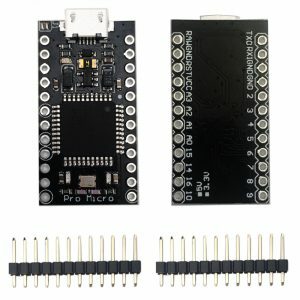 The Pro Micro is based on the ATmega32U4 microcontroller featuring a built-in USB which makes the Micro recognisable as a mouse or keyboard,it running at 5V/16MHz and the maximum voltage allowed on the RAW pin is 9V, 6-7V input recommended. There are 4 channels of 10-bit ADC, 5 PWM pins, 12 DIOs as well as hardware serial connections RX and TX on Pro Micro. This board will remind you a lot of your other favorite Arduino-compatible boards but this little guy can go just about anywhere. The ATmega32U4 chip on the Pro Micro board comes preprogrammed with a bootloader that allows you to upload new code to it without the use of an external hardware programmer. The PRO Micro board can be powered via the micro USB connection or with an external power supply. The power source is selected automatically.The Micro appears as a generic keyboard and mouse, and can be programmed to control these input devices using the Keyboard and Mouse classes. The Pro Micro has a number of facilities for communicating with a computer and other microcontrollers.such as UART TTL (5V) serial communication via RX and TX pin, serial (CDC) communication over USB.It also supports I2C (TWI) and SPI communication. — The Pro Micro is similar to the Pro mini except with a ATmega32U4 on board. The USB transceiver inside the 32U4 allows us to add USB connectivity on board and do away with bulky external USB interface. 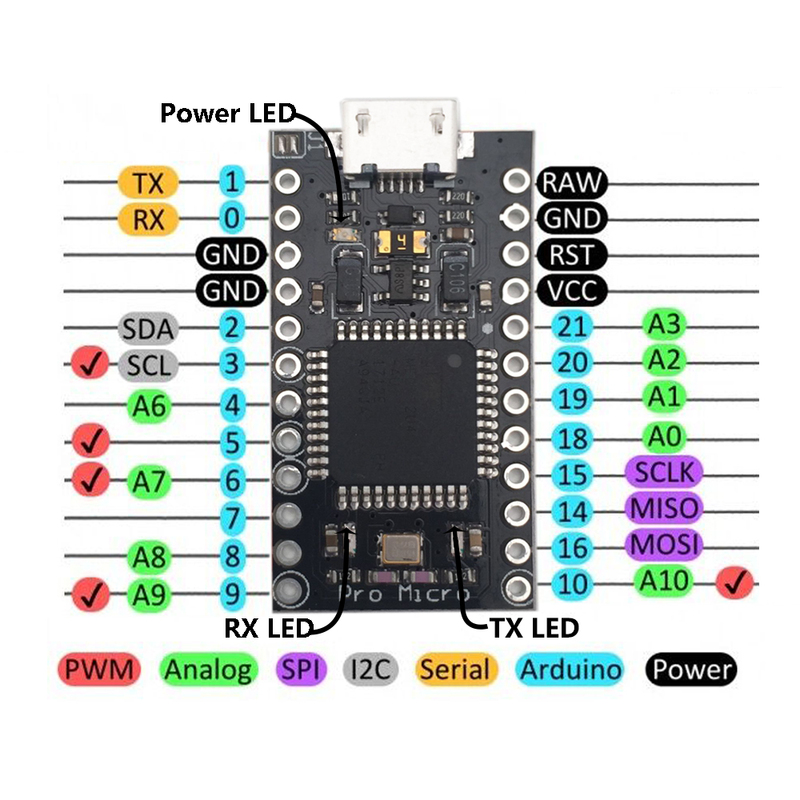 — This tiny little board does all of the Arduino tricks that you’re familiar with: 4 channels of 10-bit ADC, 5 PWM pins, 12 DIOs as well as hardware serial connections RX and TX. Running at 16MHz and 5V, this board will remind you a lot of your other favorite Arduino-compatible boards but this little guy can go just about anywhere. There is a voltage regulator on board so it can accept voltage up to 12V DC. –The Pro Micro is powered with an external power supply(not via the micro USB connection),please be sure to make the power connect to the “raw” pin and the ground to GND. is the microcontroller input voltage 3.3v or 5v?